Following the end of World War I, a nationwide feeling of peace seemed to envelop the country. Wanting to capture this, the US Mint started producing the Silver Peace Dollar in 1921. Demand for silver dollars was extremely low, and millions of the Morgan Dollars that were produced in earlier years sat in bank vaults. In order to enable the minting of new silver dollar coins, the Pittman Act required the melting of many of the Morgans. In 1921, the Mint re-started production of the Morgan Silver Dollars after a 17 year hiatus. The Morgan's would have a short run, however, as the Mint decided to change the design. As it had been more than 25 years since the introduction of the Morgans, legislative approval was not required, and a new design by Anthony de Francisci was used. Peace was to be the new theme of the coin, taking into account the end of World War I a few years earlier. 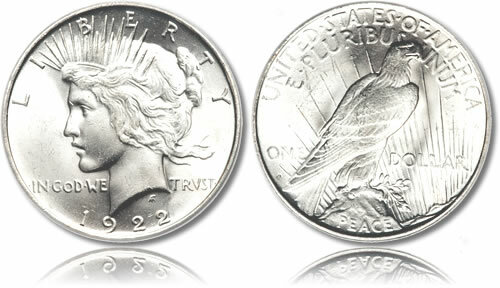 As such, the design used Liberty on the obverse and an eagle on the reverse standing on a rock inscribed with "Peace." The coins were minted from 1921-1928, 1934-1935 and then reportedly again in 1965 (All of the 1965 coins were ordered destroyed). With only 24 date and mintmark combinations, a set of Peace Dollars is easily obtainable and therefore very collectible. Higher grades can demand an extreme premium, but lower grades can be found easily for under $100 a piece for most years and mintmarks. The obverse features an open-mouthed left-facing head only portrait of Liberty. The inscriptions "Liberty," "In God We Trust" and the date are also seen. An eagle holding an olive branch is featured on the reverse, perched on a rock facing the sun's rays. Inscribed on the rock is the word "Peace." Also inscribed on the reverse are "United States of America," "E Pluribus Unum" and "One Dollar."